Mike and his team has assisted and closed on hundreds of short sale approvals. Through his brokerage Max Broock, Mike has acted as a Short Sales consultant, Expert Panelist and Short Sales instructor to his company’s franchise offices. 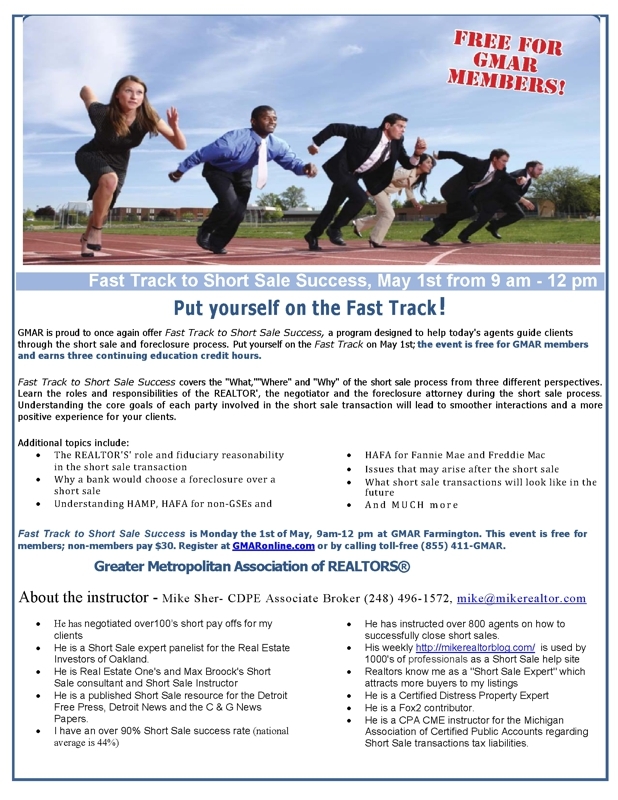 Mike is the Metropolitan Consolidated of Realtor Short Sale instructor. He also teaches for the Michigan Association of Certified Public Accountants, a expert short sale panelist for the South East Michigan Financial Planners Association as well as the Real Estate Investors Association of Oakland County. Mike writes a week blog on short sale at www.mikerealtorblog.com. CHOOSING THE MIKE REALTOR TEAM - Simply the BEST possible Real Estate Decision! It is a decision they will not regret - I am their Realtor for life! Ask me about Short Sales!! Short Sale Specialist/Pre-Foreclosure Sale: I am an expert in the field of bank Short Sales! Meaning, I negotiate with lenders and banks so they take less than the full amount the Seller owes on their Properties. This allows us to sell the house for the maximum amount the market will bear; rather than being forced to sell for the full amount owed or face foreclosure. The house will sell quicker, and will save the Seller's credit! Please come and Join me as I show how Short Sales are more about effort and less about certifications. The Mike Sher Team, Max Broock Realtors, (248) 496-1572 is proud to be a Bank of America Equator Approved Realtor. How man of short sales that have closed? Do they negotiate the short sale or pass the file to another company to do it? Are they educated in short sales?